(Please excuse the heavily marked score.) I have marked with pencil a sharp sign next to the E, but I am really not sure how this should be played. Previously, as in the first and second beat in this measure, there is a melody line in the left hand that is frequently tied to the bottom note of a chord in the right hand. However, since we are in F♯ Major, I do not know what the bottom not of the chord indicated should be. According to the key signature, it should be an E♯, but according to the fact that it's tied, it should be an E♮. 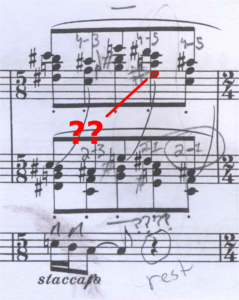 Has anyone performed this piece before or knows enough about music typography to answer this for sure? 1.) I would check at least one other version / edition of the score to make sure it is properly notated. If it's different, you have your answer. With respect to notation, accidentals only apply to the octave in which they are written. So if it says E# in the top voice but is not marked similarly at the bottom of the chord, it is E natural. Both / all octaves must be notated with an accidental if an accidental is desired. The same is obviously true between hands on the piano as well. Lastly, I just want to point out that although it wasn't stated, we are speaking about the above excerpt as if both hands are in treble clef. Notes preceding slurs: legato or not? Where do I put this expression marking?